The TV Show Gotham Deserves? It’s Batman, with less Batman. With the return of Fall television right around the corner, stations are gearing up to give us their newest, best and most original ideas. …HA, just kidding! They’re just mining the same dry well they’ve been pumping away at since the ’50s, and this season’s lineup is no exception. 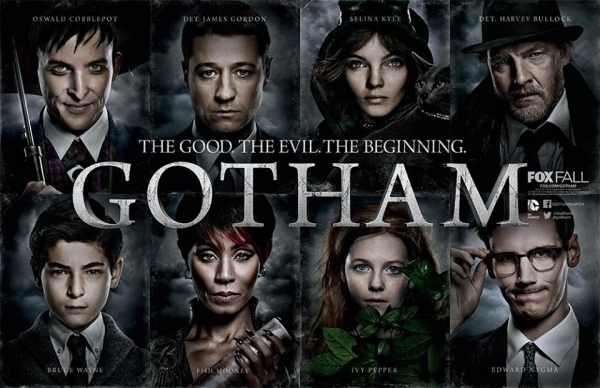 A show that’s garnering a lot of attention is the new Fox program, Gotham. Based on the early childhood of Bruce Wayne, before he dedicated his life to becoming a superhero, Gotham explores the people and events preceding the crime fighter’s crime fighting. Gotham may or may not do well, but to me the idea of a Batman show without Batman sounds like a real snoozer. However — competition in the entertainment industry being what it is — every network is probably going to want their own pre-prequel in the near future. So with that in mind, here are my pitches for shows based on superheroes, before the heroes were around. Small(er)ville: Set in the same town where Superman will eventually land, this show will focus on Jonathan and Martha Kent’s early lives as corn farmers in Kansas, who also struggle with conceiving a child. Central City: This pre-prequel for the speedster superhero known as The Flash will center on Barry Allen working his way through medical school to earn his Ph.D in forensic science. Mars: An entire show set in real-time as the future Martian Manhunter makes the five-year journey to Earth alone in his spaceship without any disruptions. Star City: The story of young billionaire Oliver Queen, living life as a carefree child before he grows up to become the superhero Green Arrow. Basically exactly like Gotham except nobody dies. Oa: Named after the home planet of the extraterrestrial group known only as The Guardians — the alien politicians who will eventually form The Green Lantern Corps. — this show follows The Guardians in their earliest days as they legislate policy and discuss what sort of jewelry best lends itself to intergalactic law enforcement. Paradise Island: The early story of Diana Troy (the future Wonder Woman) and her early years on the mythical and magical island of Themyscira, honing her powers and fighting off mythological threats of all sorts while also exploring mystical islands. Despite being the only even marginally interesting pre-prequel story, this show will get cancelled after the first episode just because the primary superhero character is female. Steel City: Follows the day-to-day life of full time construction worker John Henry Irons (aka the man who will later become the superhero Steel) as he works 16-hour days doing manual labor in a dead-end job. Gotham Suburbs: The comprehensive story of Barbara Gordon’s childhood years as an awkward preteen student in Gotham’s upper-middle class neighborhood. Plasticity: The normal story of Plastic Man, which is already boring enough without having to go back to before he was a hero. Agents of SHIELD: The agents of SHIELD and what they do when the superheroes aren’t around. …Haha just kidding, no one would want to see a premise that boring, no matter HOW desperate they were.